Mouse: Click the Start button. Touchscreen: Tap the Start button. Keyboard: Press the Windows key. Click or tap Power on the Start menu. 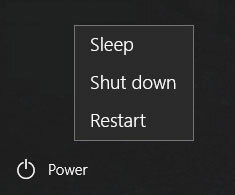 Shut Down: This option exits Windows 10 and saves power by turning the computer off. In exiting Windows 10, Shut Down closes any apps that are currently running. Sleep: This option reduces the computer’s power consumption without exiting Windows 10 or closing apps. As a result, when you wake the computer by moving the mouse or touching the screen or the keyboard, everything is exactly as you left it: apps and documents are open, if they were open before Sleep. Hibernate: This option combines Sleep and Shut Down. Hibernate records which apps are running but also completely shuts down the computer. When you start the computer, Windows 10 opens all programs you were using, just as Sleep does. Hibernate and Shut Down are equally green options — they save the same amount of power. Sleep is a little less green but saves time if you are returning to the middle of a task. Restart: Temporarily shuts down Windows 10 and turns it on again. Use Restart when Windows 10 asks you to or when Windows 10 is misbehaving. You can also shut down your computer by using the Start button. Move the pointer over the Start button and right-click. A pop-up menu appears. Select Shut Down or Sign Out on the pop-up menu, and then select an option (Sleep, Shut Down, Hibernate, or Restart). Choose Shut Down to turn off the computer. On most computers, pressing the power switch also shuts down the computer. On a laptop, closing the lid may shut down the laptop or put it in sleep or hibernation mode. For a desktop computer, consider using a power strip to plug in the computer, the monitor, and the printer. After you shut down or hibernate the computer, turn off the power strip to save power.